SMITH, Adam. 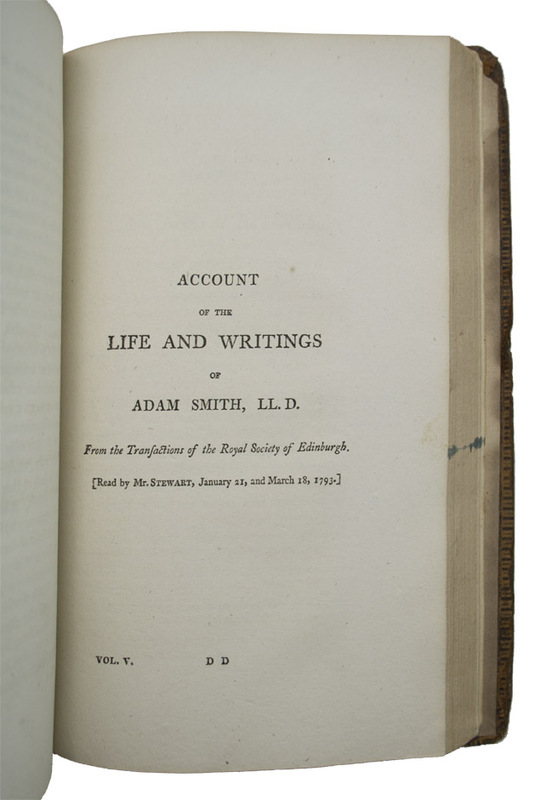 Works of Adam Smith, LL.D. ...With an account of His Life and Writings by Dugald Stewart. In Five Volumes. London: Printed for T. Cadell and W. Davies and others , 1811-1812. 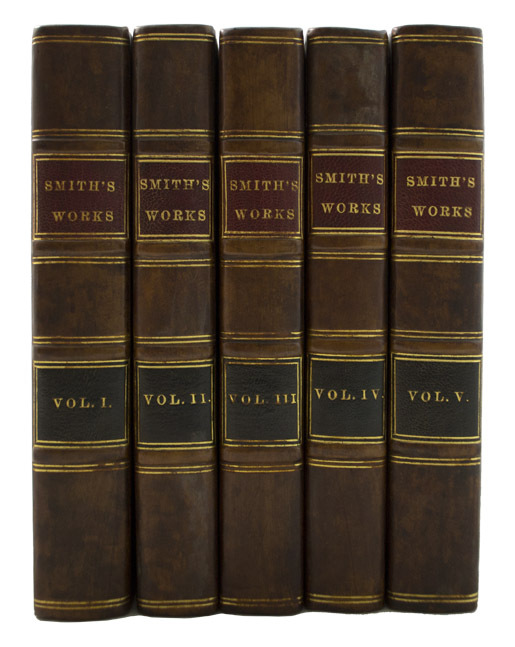 First collected edition of Smith's works, with a biography of the author by Dugald Stewart. 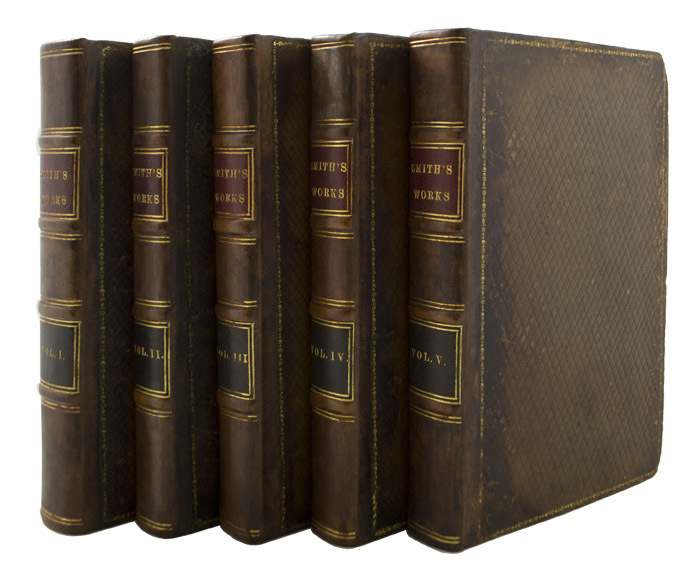 Five octavo volumes (8 1/4 x 5 1/8 inches; 210 x 130 mm). xv, [1, blank], 611, [1, blank]; viii, [2, advertisements], 499, [1, blank]; vi, 523, [1, blank]; v, [i. blank], 515, [1, blank]; iv, 584, [2, blank] pp. 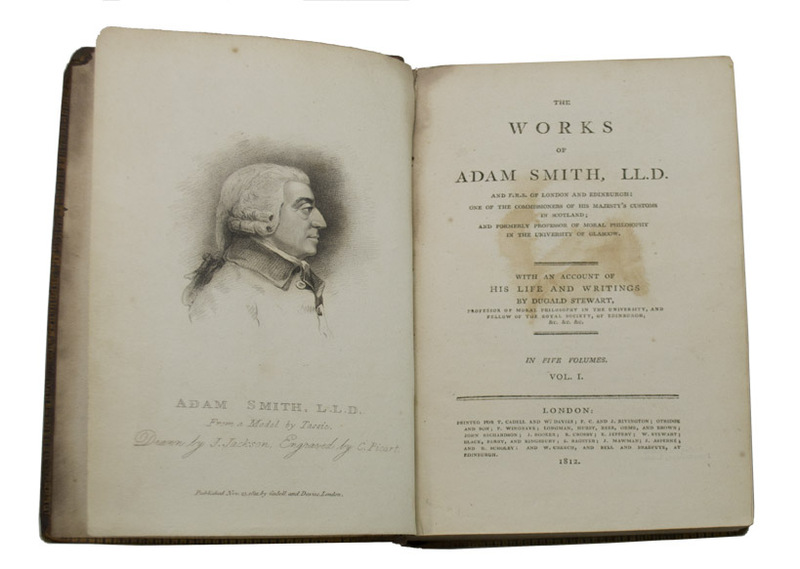 Volume I with a frontispiece portrait of Smith. Contemporary full diced calf, rebacked to style. Each volume with a red and black morocco spine label, lettered in gilt. Boards tooled in gilt. Dentelles tooled in blind. Boards with some rubbing and wear. A bit of foxing to the final two leaves of volume III, and to pages 304-326 of volume V. A small tear to fore-edge margin of page 479 in volume IV, not affecting text. Overall a very good and clean set.